On this day in dinosaurs, an attraction opened in Germany that brought life-size dinosaurs to the public on land that once belonged to the East German National People’s Army. In 2008, Dinosaur Land opened with almost 1000 model dinosaurs, all made from glass-reinforced plastics. Each dinosaur was accompanied by signage that explained more about the animal when it was alive. The park has expanded since its opening, and also includes an area with a simulated paleontological dig so that visitors can put themselves in a scientist’s shoes. There are a whole range of prehistoric lifeforms on display at the park, but dinosaurs are the main focus. 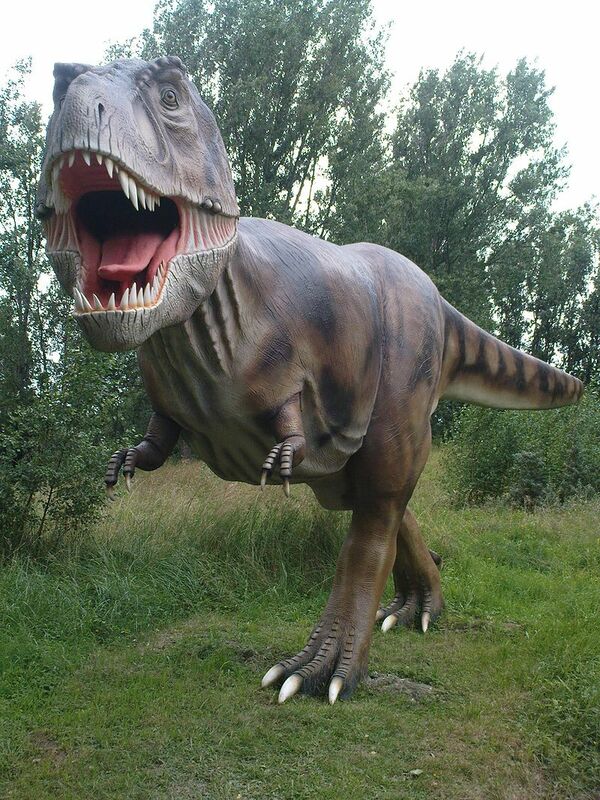 If you’ve visited Dinosaur Land, we’d love to see your pictures from your visit. Share them with us on Facebook and Twitter using the hashtag #TDIDinos. On this day in dinosaurs, the bat-winged dinosaur spread its wings into the popular imagination. 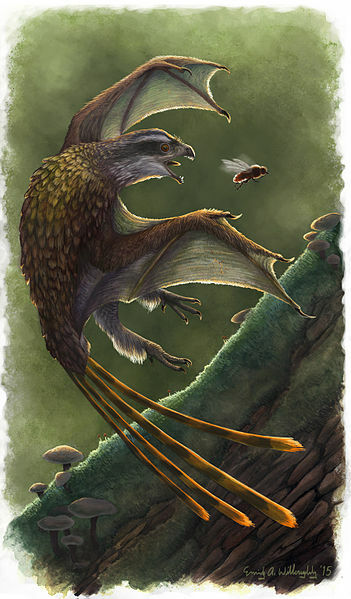 With its membranous skin flaps preserved in its fossil remains, Yi qi became an instant sensation–like a miniature bat-dragon-dinosaur, appealing to all manner of dinophiles. And like so many popular dinosaurs, Yi qi brings mysteries, questions, and debates about its true nature. The questions and speculations concerning the true nature of its long mandibles (were they supporting the skin membrane so the animal could glide or fly like modern bats or flying squirrels or using them as some kind of food-collecting instrument or battle spike?) will not be settled without additional fossil evidence. But these intriguing quandaries continue our path into the realities of the Mesozoic. These ancient riddles only become less foggy with decades of unflagging persistence from researchers both in the field and in the laboratory. Meanwhile, the rest of us will be forced to satiate ourselves with tantalizing paleo-art of Yi qi being generally awesome. Share your favorite Yi qi photos with us n Facebook and Twitter using the hashtag #TDIDinos. On this day in dinosaurs, a 112 million year old theropod from South America took its place in the paleontological sun. At about 4 feet long, the “thief from the Santana Formation” doesn’t seem incredibly ferocious, but researchers believe it may be the earliest member of the tyrannosaur family found in the southern hemisphere. Later studies indicated the dinosaur is definitely a coelurosaur, and perhaps a more distant relation of the tyrannosaurs. 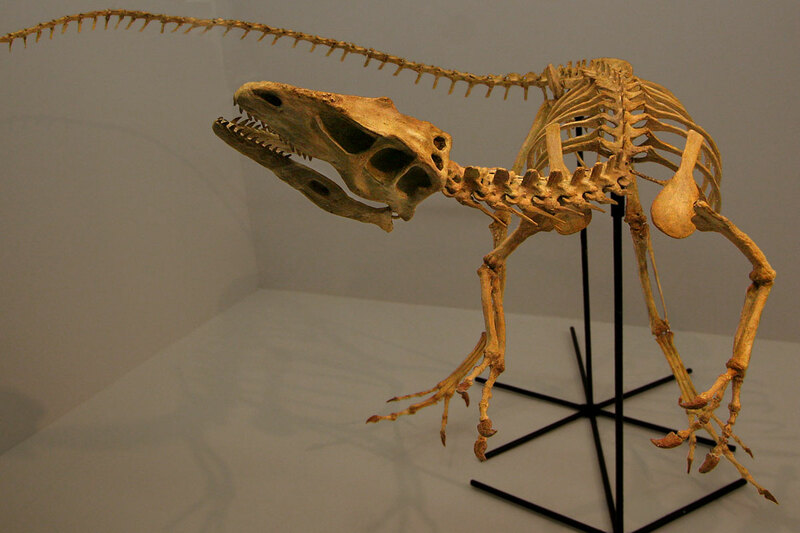 Also noteworthy, Santanaraptor was discovered with mineralized soft tissue of skin and muscle. Though the specimen was incomplete and the soft tissue fossils are not substantial enough for celebrations, the dinosaur does shed light on coelurosaur evolution on the Mesozoic southern continent, Gondwana. Share your photos of Santanaraptor and other predatory dinosaurs with us on Facebook and Twitter using the hashtag #TDIDinos. On this day in dinosaurs, one of the most famous and inspirational fossil halls shut its doors to begin a transformation. The Smithsonian’s National Museum of Natural History boasts some of the most fantastic dinosaur specimens in the United States and in 2014, these behemoths were taken from public view to allow the installation of the museum’s new Hall of Deep Time, which will open in 2019. The dinosaurs stood, largely unaltered, for decades before this renovation began. This allowed generations of families to stroll through the hall, looking up at a range of Mesozoic megafauna. It makes sense to update the old exhibits, but there will always be a special place in any dinophile’s heart for the inspirational displays of the past. 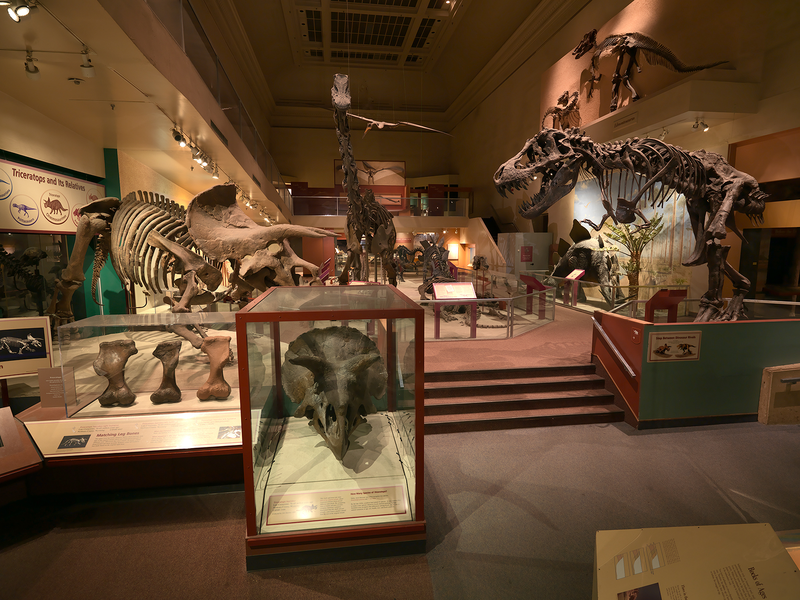 Share your photos of D.C.’s dinosaurs with us on Facebook and Twitter using the hashtag #TDIDinos. 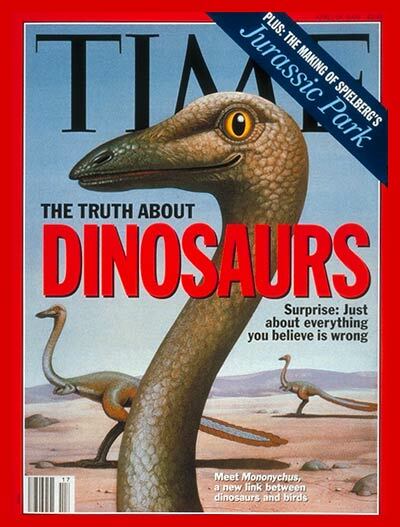 Two years later and dinosaurs were on the cover of Time. This comprehensive story detailed the dinosaur renaissance and how decades of scientific revolution was finally hitting the mainstream. It featured the biggest names in paleontology as well as previewing the latest exhibits that aimed to reinvent dinosaurs for the general public. Share your favorite dinosaur moments from the early 90s with us on Facebook and Twitter using the hashtag #TDIDinos. On this day in dinosaurs, the very first live-action dinosaur film ever made was released to the public. It’s really more about cave people than dinosaurs–which erroneously are depicted as contemporaries. But nevertheless, it’s a historically significant film for portraying a large–if not convincing–dinosaur on screen. Share your favorite dinosaur movie moments with us on Facebook and Twitter using the hashtag #TDIDinos. On this day in dinosaurs, it’s about death and birth. 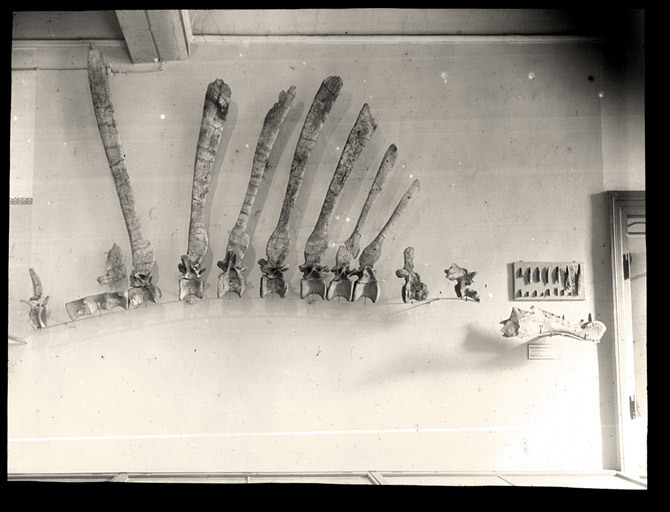 One of the most fateful nights in dinosaur paleontology transpired on this day in 1944. During a nighttime raid over Germany, the British bombed Munich, destroying Ernst Stromer’s prized Saharan dinosaurs–including one of the most enigmatic predators of the Mesozoic, Spinosaurus aegypticus. While new research is attempting to shed even more light on the bewildering carnivore, the original skeleton is lost forever. Amidst the countless human tragedies of war are irreplaceable losses to the scientific enterprise. It is with some optimism that paleontologists from both sides of World War II joined together to begin piecing together the most recent Spinosaurus skeleton. Their work is a reminder of what can be accomplished across national borders. We also want to wish Stephen Brusatte a very happy birthday today. Keep up the roaringly good work. Share your Spinosaurus photos and well wishes for Dr. Brusatte with us on Facebook and Twitter using the hashtag #TDIDinos.